It’s pretzel time again! Oh yes. This time though, I used my fabulous sourdough starter. I am finding a ton of uses for this starter and I absolutely love it. Sourdough bread, pizza crust, pretzels, I feel like the possibilities are practically endless. I had a friend come over this morning who had never made pretzels. (Gasp, I know!) Anyways, we made pretzels, had some tea, and basically had a grand old time. It was so fun, and we both got some pretzels out of the deal! I feel like sourdough anything is just a win in life. It makes things better, soft pretzels included. Whatever you do, don’t forget the last step of brushing some melted butter on your pretzels. It really takes them to the next level. In the bowl of a mixer, combine the water, sourdough starter, flour, milk powder, sugar, butter, salt and yeast until the dough comes together. Turn out onto a flat surface and knead until smooth and slightly tacky, about 5 minutes. If dough is too dry, knead in a teaspoon or so of water. If extremely sticky, knead in an extra tablespoon of flour. Shape the dough into a ball, and place into a lightly greased bowl, turning once to coat. Cover bowl with plastic wrap, and set in a warm place to rise for about 45 minutes. The dough will not rise a lot, but it will rise a little. Preheat oven to 350° F. In a large pot, boil 10 cups of water with 1/3 of a cup of baking soda. Prepare an egg wash of one egg white beaten with 1 tablespoon of water. After dough has risen, turn out onto a flat surface, and cut into twelve pieces. Roll out into a long rope, about 12 inches. Form into a U-shape, then cross the ends down and around each other into a pretzel shape. Boil in baking soda solution for 30-40 seconds. Place boiled pretzels on a baking sheet lined with parchment paper. 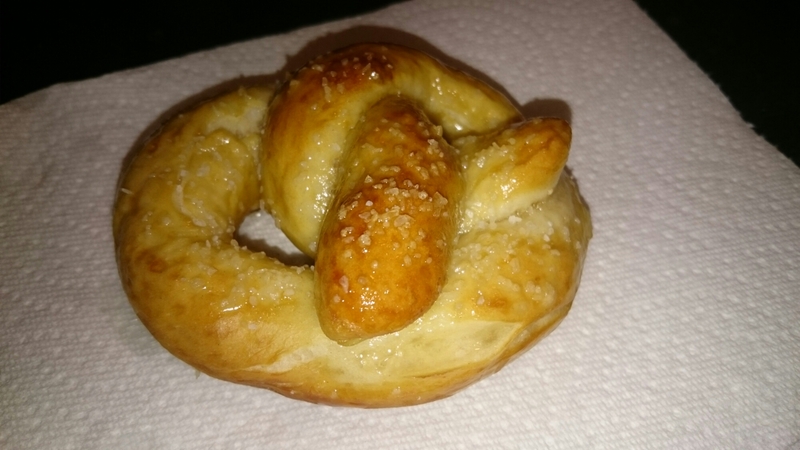 Brush with egg wash, and sprinkle kosher salt on pretzels. Bake for 25-30 minutes, until pretzels are golden brown. 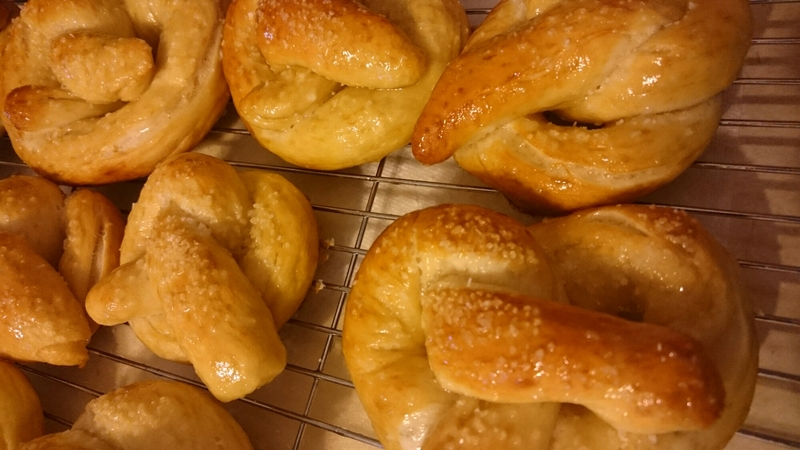 Once pretzels have been taken out of oven, brush with melted butter and sprinkle with more salt if desired. Serve warm.